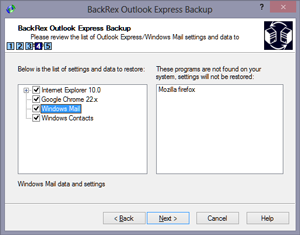 BackRex Outlook Express Backup is a backup and restore tool for Win7/Vista Windows Mail and Outlook Express. It allows you to backup address book, mail and news folders, mail accounts, message rules, signatures, stationery, blocked senders list and all personal settings. Outlook Express Backup can help you to transfer all your Outlook Express or Windows Mail data from one computer to another. Using Outlook Express Backup you can make migrations between different version of Windows and/or Outlook Express (for example from Outlook Express 5.5 to Outlook Express 6.0). BackRex Outlook Express Backup has command-line interface. You can use it to start backup and/or restore process unattended from any script or batch file. If you are looking for Office Outlook backup tool, please visit BackRex Outlook Backup program page. 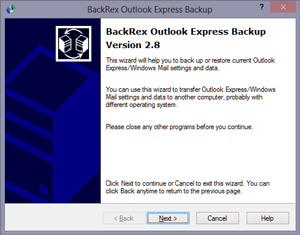 If you would like a backup tool for both versions of Outlook, please take a look at BackRex Mail Backup. Now supported Win7/Vista Windows Mail and Contacts. Outlook Express versions 4.0, 5.0x, 5.5, 6.0 are supported. Migrating between different versions of Outlook Express. Saves Internet Explorer and Firefox favorites and settings. Does not restore Microsoft Outlook Express signatures, mail and news folders, except Inbox. Does not restore Internet Explorer favorites. Does not restore Windows Contacts. Compressed backup password protection disabled. BackRex Outlook Express Backup can be ordered worldwide. Click here to order now. For immediate delivery choose online order option. You will receive download instructions in just a few minutes after placing an online order, 24 hours a day, 7 days a week.